The Boekel Scientific Flask Dancer Orbital Shaker provides consistent rotational movement at a steady speed for you biological and chemical mixing needs, right in their vessel. 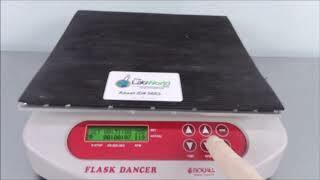 This digital orbital lab shaker features microprocessor control, operated from the low profile upfront keypad. Users of this flask shaker can set their speed, between 50-300 rpm in 10 RPM steps, and their timer preference, from 1 minute to 96 hours, in 1-minute increments. Vessels are set upon the generous 9 x 10” platform outfitted with a non-skid rubber mat, that can hold up to 5.5 lbs. This orbital shaker can be used in environments with ambient temperature ranges from 4-45°C and has an 10mm orbit.